I’ve always been a four season hiker, but that’s easy to do in the mid-atlantic region of the country. Temperatures rarely dip below the teens, and mid twenty to mid thirty degree temperatures are the norm. 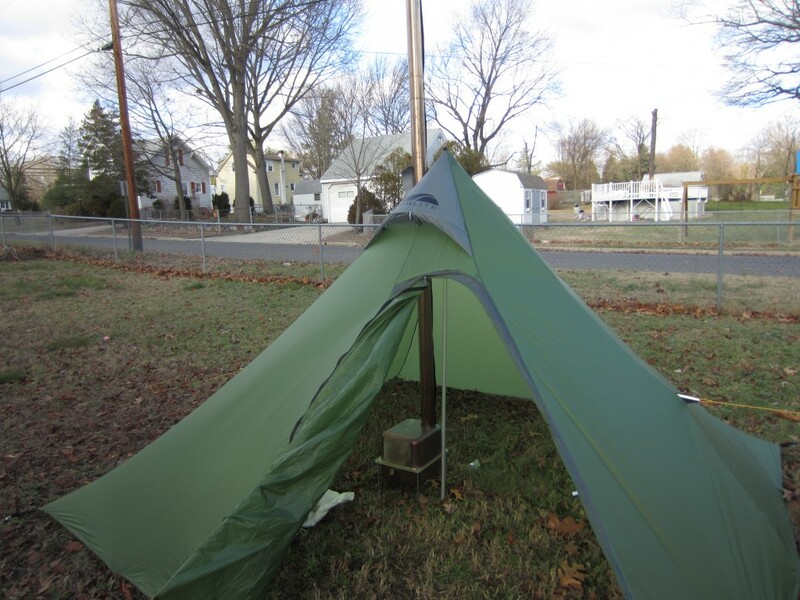 I did most of my hiking for many years on the Appalachian Trail, and either a lean-to or tarp (and most recently a hammock) were plenty fine for most conditions. There was a time when I would hit the Presidential Range in New Hampshire for winter camping, but a serious fall a number of years ago dampened my sense of arctic adventure. Over the past few years I decided to once again embrace the “extreme season”, and the Adirondacks in New York state have been my destination of choice. Temperatures can be more severe there, with sub-zero temperatures a regular occurrence. A trip last February that saw morning temps of minus 13 degrees Fahrenheit convinced me that even though I had the proper gear and experience for the occasion, I wanted to rough it a little more comfortably. Even though I consider myself a “plain man, dwelling in tents”, as was Jacob, I decided a “hot tent” was just the ticket. 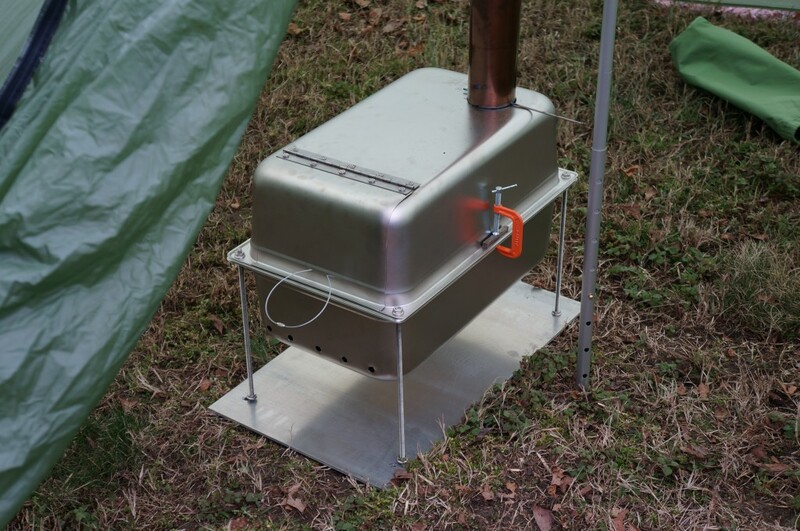 The firebox is made from two steam table trays, connected by stainless steel all thread legs. I purchased a titanium damper and spark arrester from Titanium Goat, and fashioned the 10′ chimney pipe from .005″ stainless shim stock. I’ve got about 15 hours of burn time on the stove and now that I have a better understanding I will be moving forward with my final design. 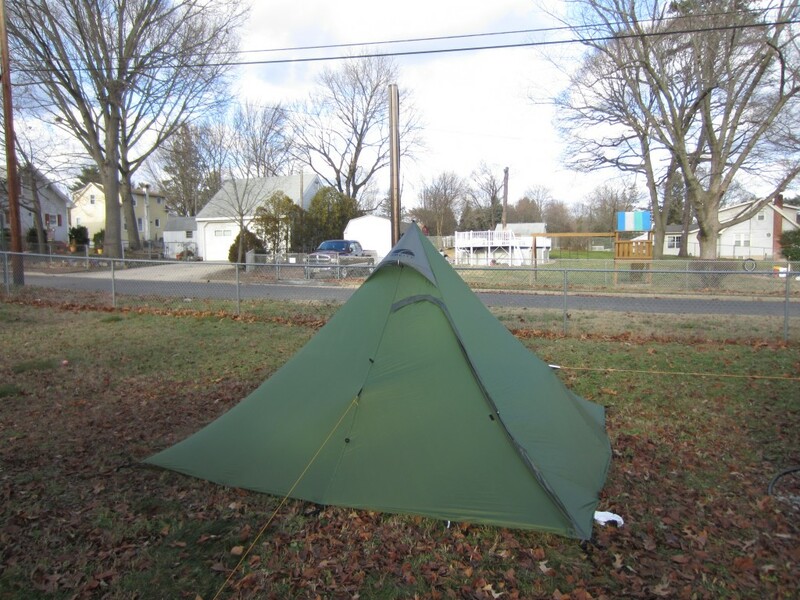 I chose the Golite Shangria-La 5 for my shelter due to it’s low weight, spacious footprint, purported four season capability, and also due to the fact I got it on sale last spring from Golite. 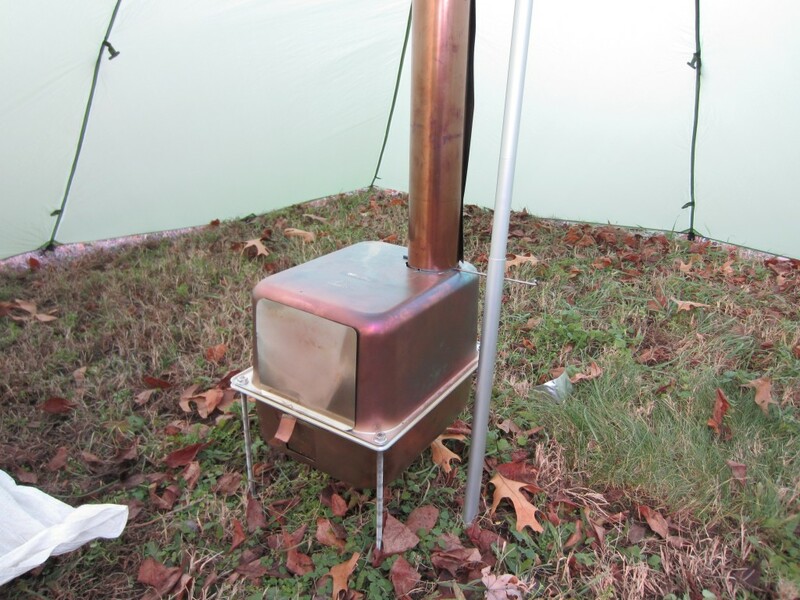 I shipped the shelter off to Seekoutside, where they expertly installed a stovejack. As you can see from the pictures, I have room for at least 3 people and their gear in my heated haven of heavenly habitation (sorry, couldn’t help myself). So, how well does it work you ask. 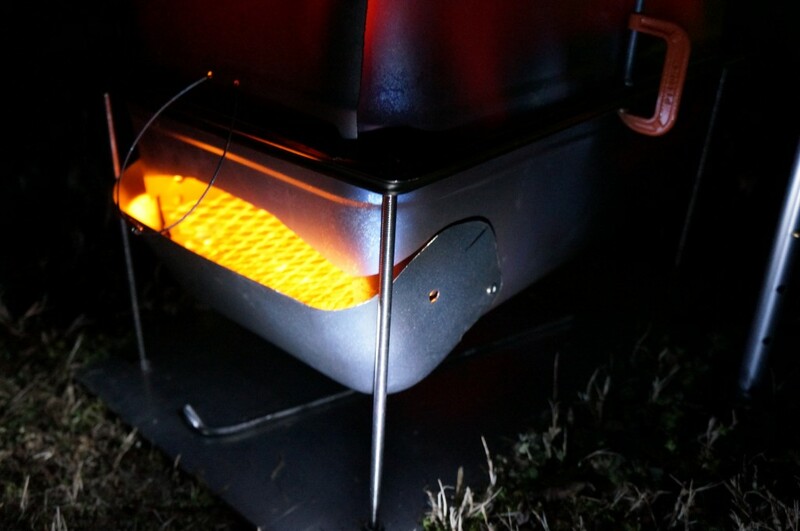 I had the opportunity to sleep out a few days before Christmas, and I can honestly say that on a twenty degree night that little stove threw out some serious heat. 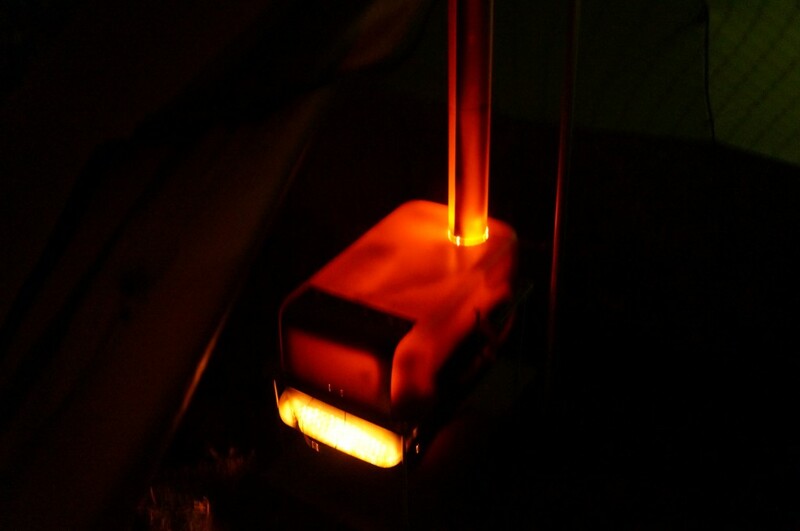 With the damper wide open everything was glowing a bright cherry red, and there was plenty of heat. I had originally thought that I would be able to lighten up my winter gear with the addition of a stove, but my night out proved that my thinking was flawed. The stove only burned for about 1 1/2 hours before it needed to be stoked again-not conductive to a long nights sleep. If you lighten up you will will be waking up every couple of hours to stoke the stove. 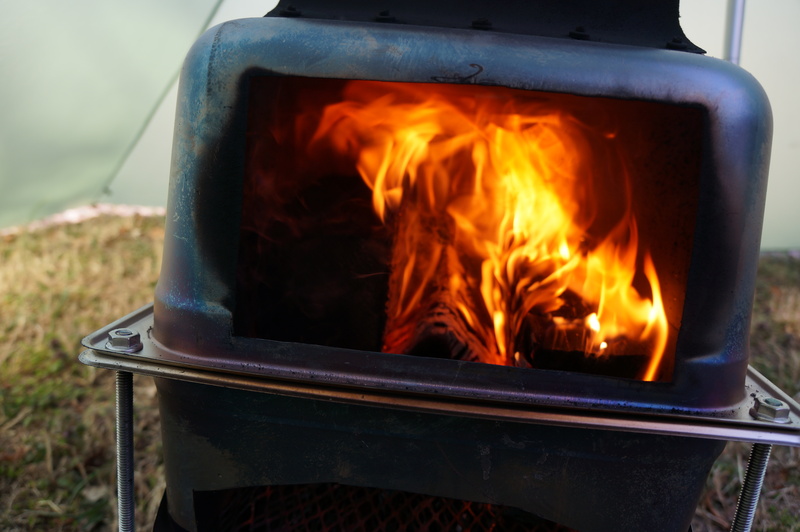 I will be making my next stove with a bigger firebox for longer burn times, but not so I can lighten up. After talking with some folks who use this type of setup I have rethought how I look at this rig. Instead of lighter winter gear, I will still bring my normal gear. I can get changed, read, cook, get out of the weather, relax, and get to sleep in comfort and warmth. Because I brought my usual gear, after the fire goes out I will still sleep through the night, and in the morning when I wake up way too early on those long winter nights, I will once again have the warmth of a fire to thaw my boots, get changed, eat breakfast, and otherwise pack up in comfort. I look forward to getting out and using this rig in the field, and will be sure to get a trip report/gear review out asap.